Buy online American Vintage Scraped Apple Cinnamon 3/8 in. x 5 in. 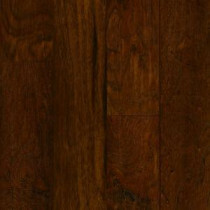 x Varying Length Engineered Hardwood Flooring (25 sq. ft. /case) EAMV5AC and leave review or share with Your friends. Add natural beauty to your home with Bruce American Vintage Scrape collection engineered hardwood floors. The individual texture of each plank is scraped, giving each one its own look and highlighting the variations in color and grain pattern. American Vintage Scraped is crafted in sturdy hickory, known for its durability and handsome grain character. Wider width planks add dimension to your room. This floor is easy to maintain and will stand up to wear and tear with its aluminum oxide finish. 25 sq. ft. per case and case weight: 38 lb.